Brightly coloured sweet peppers become edible bowls (with lids!) that hold a cheesy herbed egg mixture as it cooks over the heat of a barbecue. Serve with a side salad for a deliciously simple lunch or supper. Preheat grill to medium heat (about 350°F/180°C). Cut 1/2 inch (1 cm) off the stem end of each pepper. Remove seeds from top slices and seeds and membranes from bottom portion of each pepper. For each pepper, whisk two eggs, 1 tbsp (15 mL) cheese and 1 tsp (5 mL) parsley. Pour mixture into pepper. Sprinkle 1 tbsp (15 mL) cheese over top. Place top back on pepper. 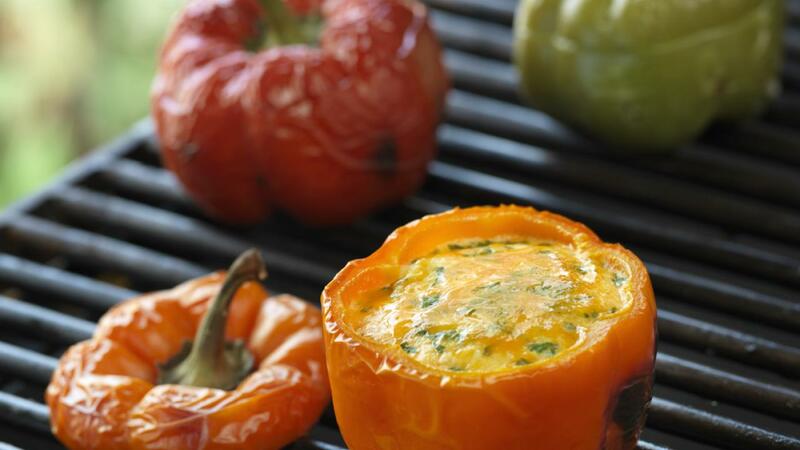 Carefully place peppers on the grill. Close the lid and cook until peppers are tender and egg mixture is set and slightly puffed, 25 to 30 minutes. • Choose plump peppers with a square shape. They should sit level. • Vary the type of cheese: try Swiss, Tex-Mex blend, feta or Parmesan. • Add diced ham to the egg mixture.